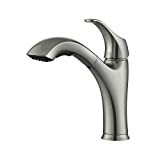 Faucet Mag has compiled Kraus faucet reviews after performing research on a selection of faucets from this brand. Never heard of Kraus? Afraid to go out on a limb and try a brand that isn’t as well known? We were skeptical about them as well, but after reading numerous consumer reports, we realized that they stack up well against better-known brands- and most of the time for a fraction of the price. 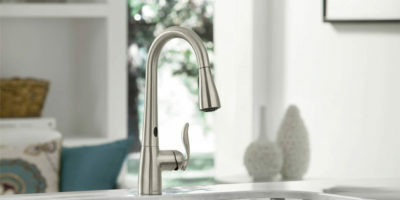 Take a look at what we have learned, and maybe you’ll find yourself remodeling your kitchen with a shiny new Kraus faucet. With a low price like theirs, why not? Slightly larger than its KPF-1612 cousin, this commercial style sink also features a handy pot filler spout. For industrial strength, functionality, and durability, the KPF-1602 is the way to go. This is the Mac-Daddy kitchen faucet. It is large and commanding, and will undoubtedly become a centerpiece in your kitchen. 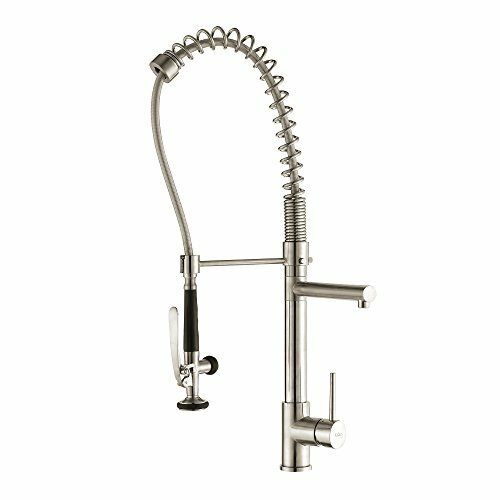 It has all of the same features you would find in an industrial faucet, including the side pot filler. 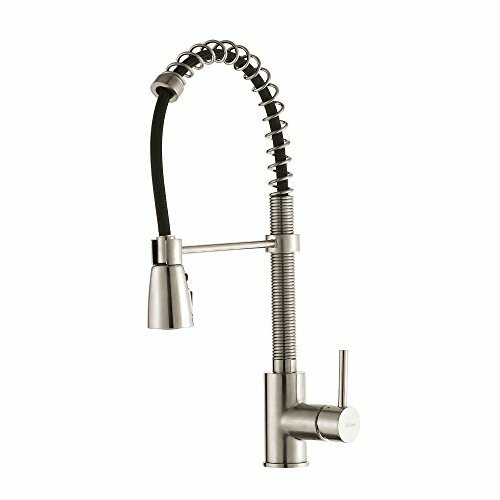 With the look and functionality of an industrial faucet, the KPF-1612 can add a professional touch to your personal kitchen. Although smaller than what you usually see in a restaurant, it works exactly the same way. You can stretch the faucet to reach virtually any corner of your sink or even to fill up buckets on the floor. The 3-function sprayer features a spray, stream, and a pause setting with the touch of a button, which allows you to bust through dishes like a pro. The faucet itself is easy to clean, including the rubber aerator that prevents hard water buildup. 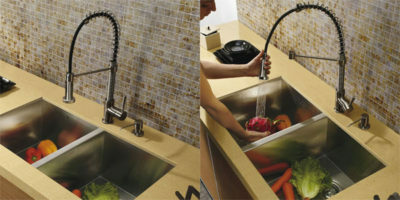 This faucet is also easy to install and can be installed for left or right-hand operation. The KPF-1612 is an extremely heavy duty faucet. If you’ve ever worked in a restaurant, you understand the benefits of a faucet with industrial design. This faucet features a clearance that allows you to fill up even large pots without the bulky height of a high arc faucet. For those that want the sleek lines of a high arc faucet without the actual height, this could be the answer. This faucet has a clearance that allows for pots to fit under it easier to fill, yet doesn’t tower over the sink taking up space. The faucet has a design that can fit into almost any kitchen and features a lightweight plastic sprayer that is easy to maneuver. Although plastic, it blends in nicely with the stainless steel base and is comparable to other pull out faucets. It is fairly easy to install and comes with almost all of the parts necessary to install in your existing space, even with up to four holes. With a price that doesn’t hurt the pocket, this faucet is also a steal. One thing that we came across researching this faucet is that it cannot have any attachments screwed on. If you have a ‘portable dishwasher’ or a water filter, you’ll probably want to look for a more attachment- friendly faucet. Some customers reported that they had to buy additional hoses to install this faucet. This purchase somewhere around $10, and would probably need to be made for any new faucet. Others reported that they need a special tool for installation because of the space under their sinks. I would recommend looking closely at your existing setup when considering this faucet. Still, others reported leaks and breaks in the pull out the hose and that the plastic pulls out part does not sit perfectly on the stainless steel base. In some cases, this was easily remedied and may have been a problem with installation, but others had to order a replacement from Kraus. 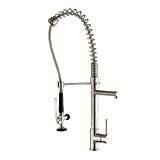 This is a high arc faucet with a sleek design. This is a simple and straightforward faucet that is corrosion and rust resistant, making it suitable for outdoor use. This is a simply designed faucet. It is made completely out of durable stainless steel. What this means for you is that you have a durable, reliable sink that won’t break. Fewer hoses and connections equal less likelihood of leaks and weak spots. For the price and the fact that it is indeed 100 percent stainless steel, this faucet could definitely be considered a bargain. If you have a pullout or pull-down faucet and it has been nothing but a hassle for you, consider returning to the basics with this model. Also, if you have an outdoor kitchen and don’t want to drop big bucks on a specialty outdoor kitchen, the KPF-2160 is the way to go. Don’t feel like it is limited to the outdoor kitchen either! 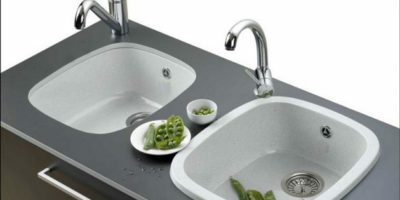 Its durability and stainless finish also lend well to garden sinks, garage sinks, and sinks in an auto-mechanic shop. When researching this faucet, the cons were actually very hard to find! Most customers were extremely satisfied with this model and had only five-star rave reviews to offer. However, as Faucet Mag editors, we dug deep and found a few reports of problems. One person noted that the hoses were too short for their sink and another reported that they were having trouble installing their water filter to the faucet. Another report stated that there was a problem in the handle of the faucet. As we said, reports of problems for this faucet were few and far between. Also, as previously stated, Kraus is very helpful in replacing parts if necessary. All in all, we at Faucet Mag think it’s very unlikely you would have problems with this faucet. 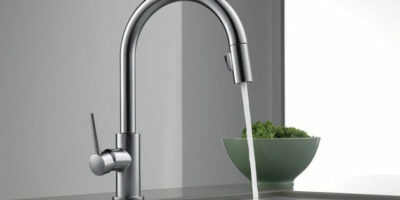 Kraus faucets boast holding three different places on Faucet Mag’s top kitchen faucets. All of their faucets are also backed by a limited lifetime warranty. Although some older reviews leave this company looking not that great, their response to customers is fantastic and improvements and updates in technology now give other brands a run for the money. 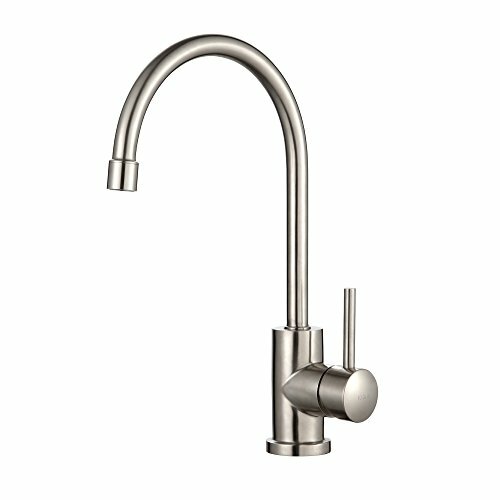 Speaking of money, Kraus faucets are almost all budget-friendly, so if you’ve been wanting to remodel and the bank account says no, consider buying Kraus. Kraus also supports the Wounded Warrior Project, an organization that helps support wounded veterans of the US armed forces. Kraus commits to excellence using state of the art equipment and the latest technology in plumbing fixtures. All Kraus faucets include patented Neopearl aerators and ceramic cartridges that eliminate leaky, dripping faucets. They start with the finest materials available and end with superior packaging that safeguards their precious workmanship. In researching Kraus, the secure packaging is a point that comes up over and over. In between start and finish, Kraus faucets go through manufacturing, a six-stage polishing, and an inspection. After assembly, each faucet is tested with both air and water for steadfastness. With the quality assurance that specializes in attention to detail, your faucet should arrive well made and packaged as expected. If not, contact Kraus with any issues and they will be happy to help you out. Please note that in order to receive any parts or services covered by warranty, you must have your original receipt. I would suggest putting it in a safe place, just in case. After all, it is a lifetime warranty. Overall, Kraus is a dependable brand. In researching these faucets, we found that a lot of customers originally shied away from this brand because it is less known and more inexpensive than other brands. However, these same customers who ultimately bought Kraus were all pleasantly surprised. As a bonus, they also saved money, sometimes up into the hundreds of dollars! Kraus has a wide variety of faucets. For the industrial look (and function) you can choose from the KPF-1612 or the KPF-1602. For a more industrial look, go with 1602 or to save space with 1612. 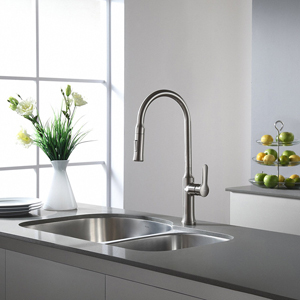 For a simple, sturdy faucet, the KPF-2160 Single Lever Stainless Steel Faucet is a clear choice. Although it lacks the bells and whistles of fancier faucets, this also means it has less moving parts to malfunction. This is also a clear choice for outdoor use, as it is rated to stand up to the great outdoors. If you’re more of a bells and whistles person, Kraus also has the KPF-2250 Single Lever Pull Out Faucet. There is a Kraus for everyone (and in the budget, too). 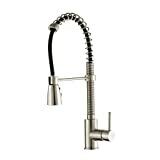 I’d suggest checking out Amazon for all of these faucets, especially the KPF- 2250 Single Lever Pull Out Faucet which is an Amazon exclusive. 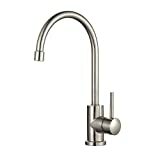 We at Faucet Mag hope these Kraus faucet reviews help you find the fit for your kitchen.